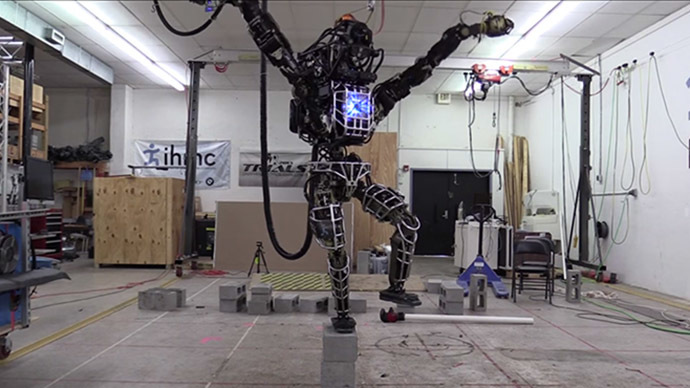 Google-owned robotics company Boston Dynamics has showcased its latest creation in a family of four-legged robots. The trimmed down electric version of BigDog, called Spot, is capable of operating indoors and withstanding hard kicks. Spot is the latest addition in a line of high-end robots being designed and developed for the US military with funding from the Defense Advanced Research Projects Agency (DARPA). 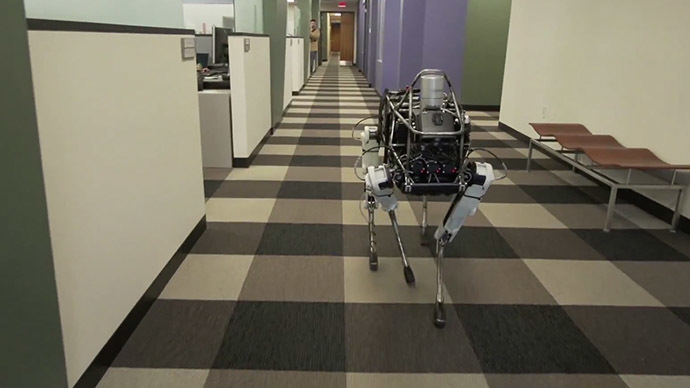 In a YouTube video released by the company, the new, smaller bot stands in a showroom in line with its four-legged big brothers, before quietly going out for a walk around the building. The slimmed down version of the four-legged mechanical friend weighs about 160 lbs and runs on an electric engine, making the robot much quieter than its predecessors. Spot can also operate both indoors and outdoors, making it a lot more versatile and stable. Introducing Spot: http://t.co/lG3STBVbS5 via @YouTubeWILL GOOGLE’S NEW ROBOT BE USED TO HUNT “NON-COOPERATIVE” HUMANS? In the video, Spot – electrically powered and hydraulically actuated – tackles steep slopes, steps, and uphill grass terrain, as well as a slippery surface. It can even stabilize itself after a hard kick to the side by a human. 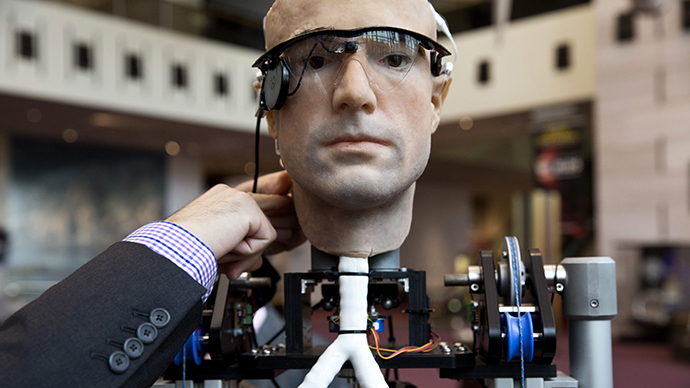 With future software updates and a skilled operator, the new robot appears to be potentially capable of searching and detecting a “non-cooperative human subject” with the ability to “intelligently and autonomously search” environments during pursuit – all in line with the old government specifications. 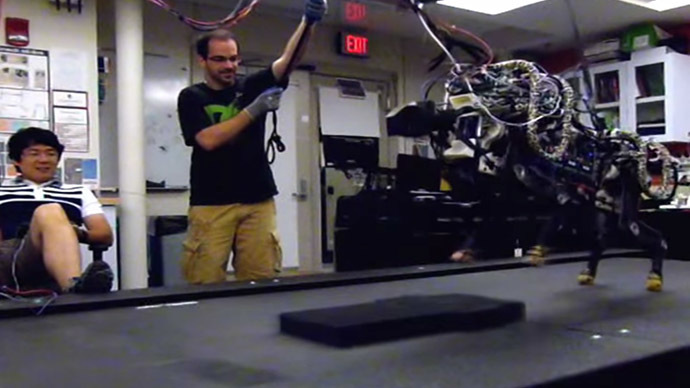 Before it was purchased by Google, almost all of Boston Dynamics’ projects were funded by DARPA – but the new video makes no mention of the funding from the Pentagon. It does, however, state that "no robots were harmed in the making of this video."